“All of the things I ordered should be here on Thursday between 2:15 and 6:15pm,” she said. My daughter had placed several orders at the end of the year for her business. Seventeen boxes were expected to arrive at our house Thursday with twelve more to come on Friday. Thursday evening, as the clock was getting nearer to 9 pm, I began to doubt that she was going to get anything. 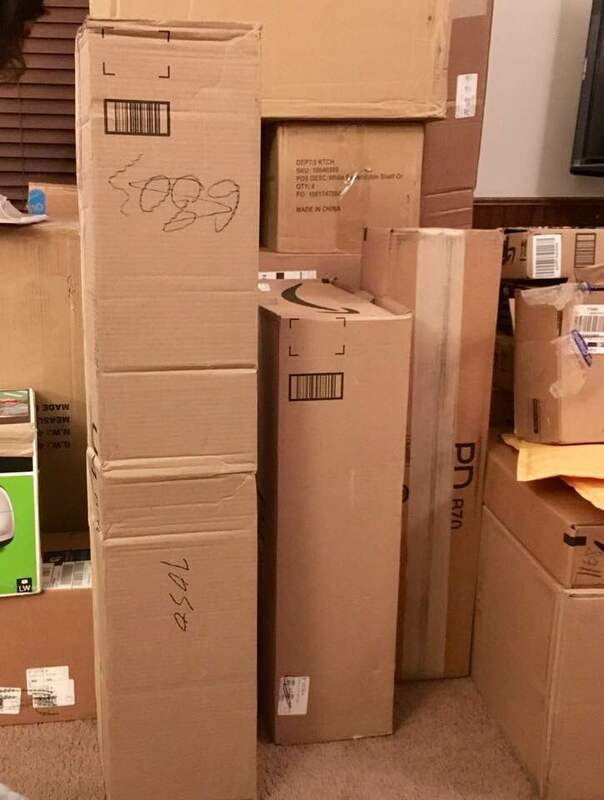 At 9:45, she got the dreaded notification that all of her packages would be arriving on Friday at the same time of day that had been previously promised. I had already had trouble with this particular delivery company being late and delaying my orders. “I am going to complain to the company,” I said as I went to bed that night. I had put it out of my mind until the next evening when six o’clock was looming. Both of us had been looking out the window at any slight sound that would indicate the truck with all twenty nine packages had arrived. I felt my irritation growing as I started to assume that no one was going to show for a second time. I went into the kitchen to prepare dinner when the doorbell rang. I opened the door to find a man hefting four boxes balanced precariously and breathing heavily. I felt my mouth drop open while my mind tried to switch from annoyance mode to sympathy. He stalked back off to his truck that was parked perpendicular to my driveway. “What?” was all she said as she grabbed her outerwear and flew out the door with me. I could hear him moving possessions in the back of the truck. The windchill was wicked and within moments my face and lips felt like stone. My daughter took a few items to our front door while I waited for another load. “Two blocks ago,” he answered matter of fact like. Instantly, I thought maybe he and his dad weren’t close. I received no response from him, but then I realized he had called someone. My daughter returned to my side. Another round of packages were shoved our way and we each took another trip up the driveway. To speed up things, I jumped on the truck and began to look through the load with him. He had gotten off his phone as we looked for the last two items that were on the list. “Well, this is all too much for one person to handle,” I said. I wasn’t just thinking of all the stuff she had ordered but his situation as well. My fingers were getting numb as the cold was setting in viciously. “I don’t know how you do this every day. It is freezing in here!” I was trying to help as best as I could. All thoughts of complaining about the delays were the farthest from my mind. I was finding out quickly that his job was not fun in such brutal weather. “I think the last two things will be coming tomorrow. I don’t think they are on this truck,” my daughter said to us from the open side door. He blinked a couple times and then a huge smile appeared. “No, no no,” he said as a started to laugh. “My dad didn’t die! My diad died.” He held up his scanner. “Well, that makes me feel better!” I said laughing along with him. We said goodbye and the warmth of my house never felt so good. I realized later that because I thought he had lost his dad, my attitude about the delivery being late was forgotten. My perspective had changed just with one simple sentence that I had not heard correctly. I began to wonder how many times I could have circumvented a negative emotion had I taken a step back and changed my mind before I reacted. How much time have I wasted on being upset over something that I am not going to remember a week from now? How much of my energy have I given up punching at the air? We have universal control over how we respond to a situation. I think that when we chose to say something in a way that is peaceful, then we and the receiver are at peace. When we chose to respond with anger then it not only fuels our fire but the one who is listening has to take in an earful. Even though I looked quite foolish dashing and rushing trying to help out a person who I thought had a death in his family, I was thankful that I hadn’t gone ahead with what I had planned on saying to him. At the end of it, I had wound up laughing and probably made that guy’s day a lot happier. Only God can make a lesson come like that in a special delivery.